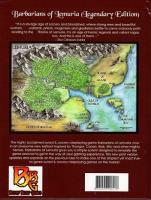 Barbarians of Lemuria is a heroic role-playing game set firmly in the sword-and-sorcery genre. 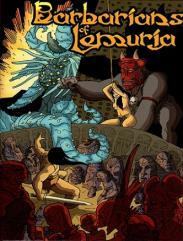 Lemuria is a post-apocalyptic world thousands of years in the future and unrecognisable to anyone from today. The continent has returned to an almost prehistoric state – a land of steaming jungles, vast untamed wildernesses, horror-filled swamplands, and sunbaked deserts. Massive man-eating beasts roam the unexplored regions of Lemuria and beyond, from island-sized sea serpents capable of sinking wargalleys, to the huge jungle-dwelling dinosaurs that can swallow a man whole.